According to a You-Tube video Internet activists from the hacking group Anonymous vowed on Friday to attack Russian government websites ahead of the May 7 inauguration of President-in-waiting Vladimir Putin. But Putin's spokesman dismissed the threat. "Taking into account the great experience of the special services and their effective work in countering hacker attacks, we hope that everything will be ok, " Dmitry Peskov told media. How many of you know, on May 6 in Moscow will be a mass demonstration against the election illegitimate. 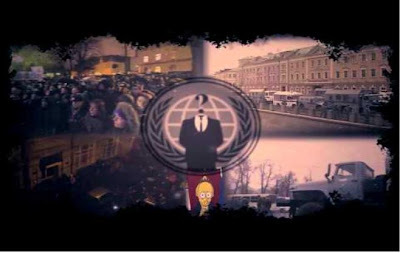 We support the protest off the false state sites and, above all, the site of the Government of the Russian Federation, which was collected by deception and fraud. We urge you to support our action. Let the servants of the people will see the love of the people who elected them to the "most transparent and fair election in Russian history." REMEMBER! These people are stealing our money, put in prison, casual and innocent people, using the police as the lackeys, and their offense go with his hands. These people are completely discredited concepts such as "Democracy," "right" and "Freedom." If you did not choose this power, and if you are opposed to self-selected May 7th crowned himself president for the third time - join us. Just a few simple steps will bring rotten corrupt system to a legitimate loss. She will destroy herself - it is only necessary to give it a kick..."
The full press release can be found on a pastebin release by the hacker group.